I have actually found it a bit tough to get painting this summer, I dislike the heat and it has been very hot, even hot inside with AC. I believe this has made me a little sluggish, but I have a lot coming up in the gaming world, with couple of trips to Montreal this fall, as well as the La Bricole painting challenge, so it was time to get going. Lot on the side table including Barron Larrey's ambulance stand, 4 points of SAGA, 2 partial battalions of Hanoverians as well as a project to re-do my casualty markers. These photos, I should really do more, document my entry into the Salamanca challenge as required by the contest rules. 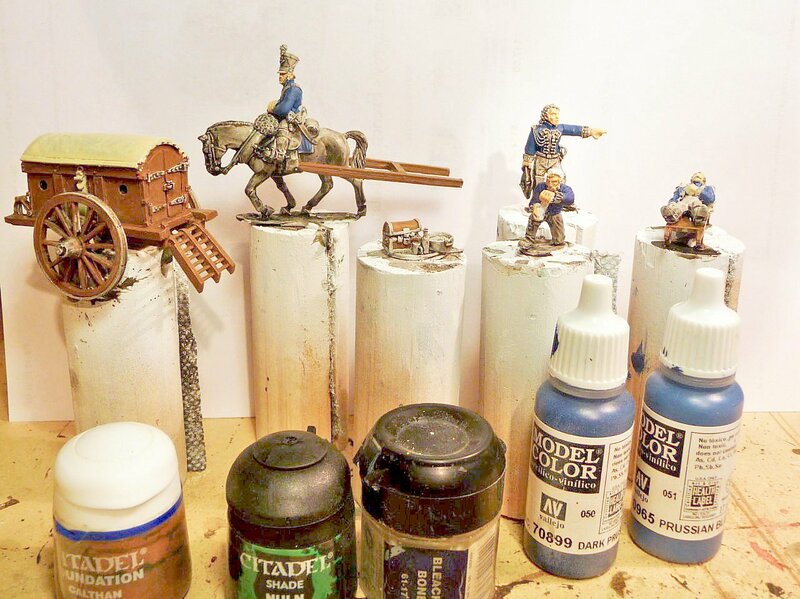 I believe it is unlikely for me to change from my white primer technique, I could understand using colour primers (WWII), but just do not get black priming. Just too much work. I use an air gun in the winter, but when it is warm I spray outside using my favourite white primer AP white. This goes on very smooth, just takes 2-3 sweeps and has a beautiful matt finish that really I believe has a lot of tooth. Black is useful though as a wash to bring out the details on the figure and to fill in the creases so when I block colour I have clean margins. this is the first time I used the new Citadel wash Nuln Oil, it has a little too much pigment, I prefer the Baobab Black, but so it goes. I understand AP has some new washes I will have to try their Darktone equivalent. But general it went on OK aside from the splotch on Larrey's right arm. I have stuck with the Citadel Elf Flesh for the skin, but used a 50:50 mixture of Elf Flesh and Citadel Rotting Flesh for the wounded grenadier. Over 20 years of looking after patients with hemorrhagic shock has made me aware that people with no blood indeed look green! I thought long and hard about whether to paint the Ambulance French gun carriage green, but decided to go with brown as in the Warlord Games website illustration for this model. This is 2-3 coats of very thinned Citadel Calthan Brown. It went on a little too thick, I believe as the colour looks denser than I like. This also maybe a function of the black wash going on too dark. I have to wait and see, I usually decide after the AP dip application about dry brushing. I have decide that Vallejo Prussian Blue will be my standard French blue, I used a Dark Prussian Blue on the crouching medic for some variety. I have used my old standby Citadel Bleached Bone for the tarp and straps. I have almost finished another unit of Skraelings which I should post in the next couple of days, and I have just received my latest Litko order, so I will also start rebasing my casualties. I have decided it is simplest to go with the Archduke Charles method. I think the ambulances were never painted green but only varnished, so you,should be fine! Very nice work, John. The ambulance is coming along very nicely. very interesting hearing how you go about creating your collection.